Too early for Neil Diamond? Just couldn't write about a chair with out singing that song. Such a weird song. Anyhoo...on to my chair, chairs actually. Remember the desk I bought for the hubby? Well having something to sit at while working on said desk is optimal ;) and I wanted something rustic since the desk was very modern. So when I saw these chairs on Cassie's website, I knew they would be perfect. I decided that I would take them both and use one for my desk as I was feeling like my current chair wasn't the look I was going for anymore. Ugh the cords!! They are the bain of my exisitance!!! Why can't electronics be pretty? As for the chair I replaced on my desk? I may paint it and donate it as part of the habitat heroes link party. Wanna know more about this super cool party? Click here. I also hate cords. The stupid things are always in the way! I love both chairs, Andi! They're beautiful. It is NEVER too early for some Neil. Love the chair...and that little gal is sweet too! It's never too early for Neil! LOVE the chairs!!! :-) agreed on the cords - they need to hit the road - seriously. the chair looks awesome!!!! both of them are perfect in their new homes! I love the chairs! They are both lovely. 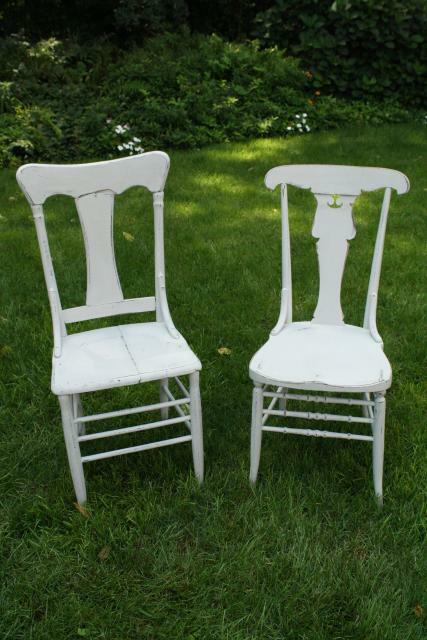 Lovely chairs! It's not like the first chair was wrong for the desk, but the new one just FITS.